Pursuant to the Interim Order Regarding Electronically Filed Claims signed by Chief Bankruptcy Judge Kevin Gross on October 9, 2012, the bankruptcy court now accepts claims filed electronically. Please note that electronic claims cannot be filed in cases with an assigned claims agent. In addition, the electronic claims system does not require a username and password and is not accessed though CM/ECF. 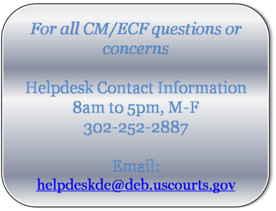 The Court's electronic claim filing system is accessible through the "Filing a Claim" link on the Court's website. That link is located on the front page of our website and is also found under the "Programs & Services" tab at the top of that page. Claims filed electronically appear on the claims register for the case number entered. For more information on how to file an electronic claim, please review the electronic learning module on "How to File an Electronic Claim," located on the "Filing a Claim" page. 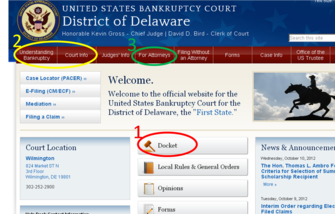 The United States Bankruptcy Court for the District of Delaware instituted an annual process to review and consider comments and revisions to its Local Rules. The comment period is October 1, 2012 through October 31, 2012. Any comments should be emailed to the United States Bankruptcy Court for the District of Delaware at the following email address: Local_Rules@deb.uscourts.gov or emailed to Kimberly LaMaina at kimberly.lamaina@skadden.com. All comments received will be discussed by the Local Rules Committee to ascertain if there will be a revision to the Local Rules. Pursuant to a provision within the Temporary Bankruptcy Judgeships Extension Act of 2012, effective November 21, 2012 the filing fee for a Chapter 11 case will increase to $1,213. The Judicial Conference approved amendments to three fees in the bankruptcy court fee schedule to correspond with the mandated increase. The fee for filing a motion to reopen a Chapter 11 case and the fee for filing a case under Chapter 15 of the Bankruptcy Code will increase to $1,167, while the fee for filing a motion by a debtor to divide a joint Chapter 11 case will increase to $1,213, on November 21, 2012. The Judicial Conference approved a $25 fee for the transfer of a claim in a bankruptcy case. The fee becomes effective May 1, 2013. Unsure where a specific event is located in CM/ECF? Select the Search button from the blue menu bar. Next enter a key word in the text field. All events containing that word will display. Select the link from the Search results screen to begin docketing immediately. You may have noticed that www.deb.uscourts.gov has gotten a facelift. This redesigned website is a culmination of efforts within the Third Circuit to create court websites that allow each court to display localized information, but to display it using the same "look and feel" ( web page design, menu definitions, site organization, etc.). 1. Docket: clicking on Docket from the homepage will display a listing of all hearings scheduled for that day, including cancelled hearings. 2. Red Menu Bar: when hovering over the topic in the menu bar a drop down list will display, however the menu selections are also buttons. For example, when hovering Forms, you are able to select all or local forms from the drop down, but clicking on the red Forms button displays a homepage of general forms information. 3. Training ELMs: on the CM/ECF Attorney Training page under For Attorneys, there are electronic learning modules (ELMs) to walk the filer through docketing specific pleadings. Just click on the link and the module will begin automatically. New ELMs are added regularly.